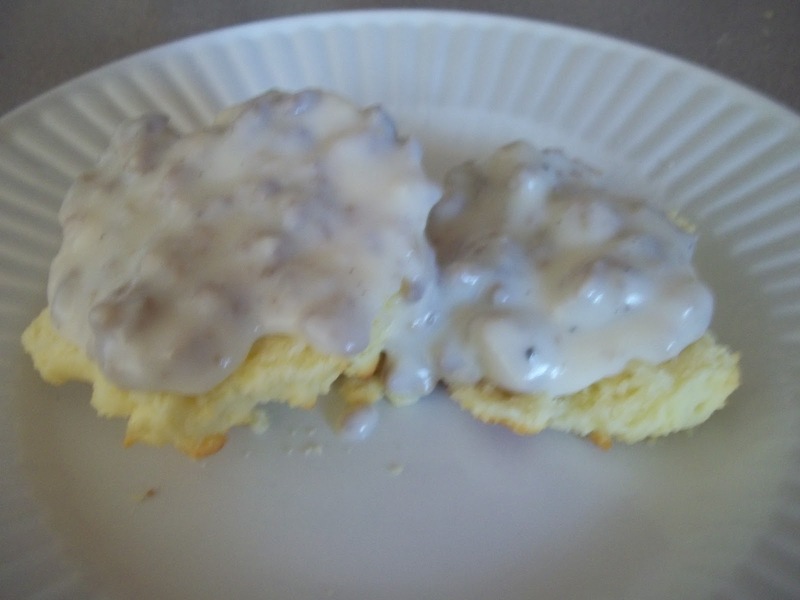 One of our favorite breakfast foods to eat is biscuits and gravy. We especially love to eat this over an open fire while at reenactments. Brown the sausage in a pan and drain. Add 3 cups of milk to the pan with the sausage. In either a bowl or in a measuring cup slowly add in cornstarch with 1 cup of cold milk and mix till dissolved. 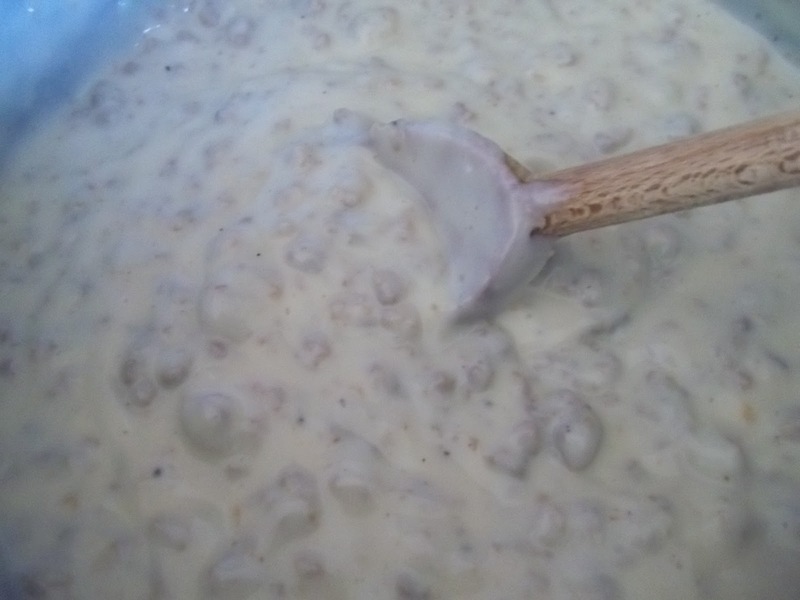 Add that mixture in with the rest of the milk and stir till the gravy thickens. The amount of cornstarch you use will depend on how thick you like your gravy. I used 7tbsp and it was as thick as condensed cream of chicken soup. Add in salt, pepper and garlic powder to taste and mix well. Serve over your favorite biscuits! This also tastes good over some toast. This entry was posted in Breakfast, Recipes on April 12, 2012 by Kandi. Looks yummy! I have to share the first time I did gluten free gravy I didn’t have cornstarch so I used tapioca starch. It looked horrible(well like pudding, lol) but it tasted good! Hope that made you giggle, it did me remembering. Incredible recipe, thank you so much! I ended up making mine too thick – I wasn’t patient enough and added a few more tablespoons…. Still tasted great though! Glad you enjoyed it! I have made it to thick numerous times as well. I also make it a little runny sometimes lol. this brings back memories of my moms biscuits and gravy. one of favorite breakfasts! great recipe! I have pinned this for later use! I’ll have to make this for my husband! He would love it! Bless you for this perfect recipe. I made GF biscuits from the Bisquik mix today and those on their own made me cry a little; I’m now going into a food coma after putting this gravy on them. Some things you will find in this blog are some recipes, crafts I do with my kids and some misc ramblings of a mom, a business women, a photographer in training and a law enforcement wife. The words and stories on this blog are my own and the photos are taken by me. If I use a photo from another source I will give credit to that source. While I do not mind that you share my posts (I actually encourage it) I am going to request that you do not use word for word any of my thoughts. I also do not give permission for my photos to be used with out contacting me. As to Pinterest- you have my permission to pin photos from my recipes and my crafts. Any picture in a post with the "Photography" label may not be pinned.